The village film club screens a variety of entertaining and thought-provoking films at the Village Hall once a month between September and May. You can join for the whole season or come along as a non-member and pay on the door – we welcome visitors, whether you are here on holiday or just passing through. There are free film notes and most feature films are preceded by a short film, in between which is an intermission for ice creams. We are a very friendly club! Membership costs just £25 for the season of nine films or £5 per film on the door. Accompanied older children/teenagers are very welcome to attend, providing the age classification of the film is appropriate. All films are shown at Youlgrave Village Hall on Holywell Lane and begin at 7.30pm. For membership enquiries please contact Pat Cleaver on 01629 636836, patriciacleaver1@gmail.com. Among the highlights of the last few seasons: Spotlight, Suffragette, Brooklyn, The Theory of Everything, X+Y, 12 Years a Slave, Captain Philips, The Book Thief, Philomena, Life of Pi, Argo, The Great Gatsby, Salmon Fishing in the Yemen, War Horse, The Best Exotic Marigold Hotel, The Artist, The King’s Speech, Made in Dagenham, Black Swan, An Education, Invictus, Looking for Eric, The Reader, Crash, The Lives of Others, There Will Be Blood, Son of Rambow and The Kite Runner. The village film club began in 2003 with a screening of Brassed Off. Using equipment borrowed from another village film club (plus their projectionist), 100 or so local film-goers enjoyed a glass of wine and a live performance by Youlgrave Silver Band before the movie began. It was a successful beginning and inspired us to go on and successfully apply for funding to purchase our own equipment and launch our inaugural season. The first six films we chose were: The Third Man, Amelie, Best in Show, One Hour Photo, The Pianist and Bend it like Beckham. They were well received and our audience has remained enthusiastic and loyal ever since. From the beginning we decided to choose an eclectic mix of films that would entertain, inspire and sometimes challenge our members. They themselves were regularly asked for recommendations and we gather feedback on each film we show. A village film club like Youlgrave Cinema is unable to show new releases, but we rarely choose blockbusters anyway and instead go for high quality films that provide a memorable Friday night out. We also deliberately set out to educate as well as entertain and ‘world cinema’ (foreign language) movies feature in every season. Films like Cinema Paradiso, The Story of the Weeping Camel, Il Postino and The Diving Bell and the Butterfly have proved very popular. However, Youlgrave Cinema can trace its roots back much further than 2003. 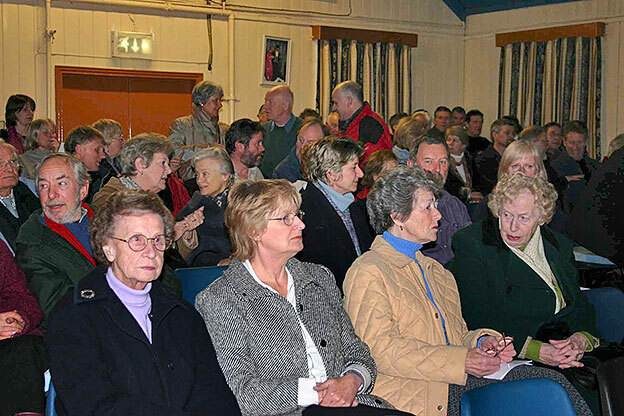 Over 60 years ago the historic village hall was packed each week for the screening of movies and newsreels. 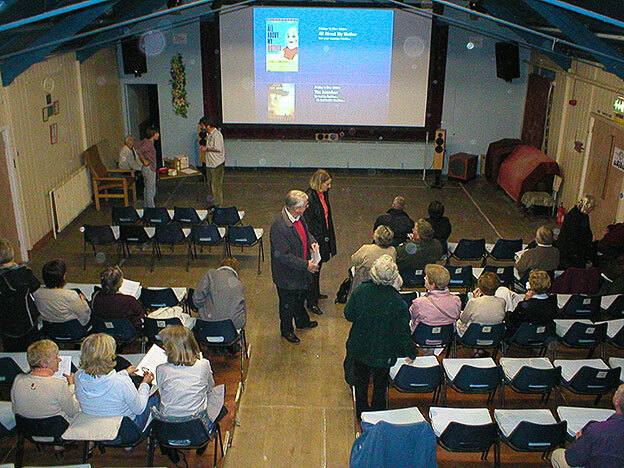 Then – as now – the films were screened from the purpose-built projection box high up at the back of the hall. A few of our older members sat more or less in the same place that they did in the 1950s when they watched Gaumont newsreels on a Saturday afternoon. 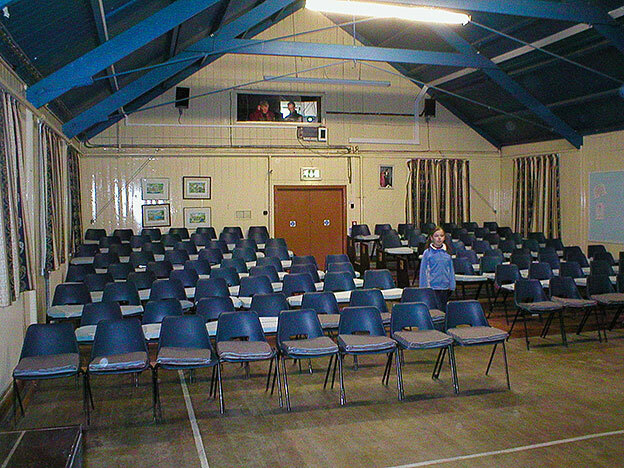 The continued success of Youlgrave Cinema today perhaps proves that despite competition from commercial cinema, DVDs and home entertainment, and now on-line streaming, there is still something quite special about sitting down with friends and likeminded people in a cosy village hall on a Friday night to enjoy the big screen experience. We hope you will join us.